Day Three at Penland ~ Cage, Limits, Scores and More! It's nearing the end of day three at Penland and it's hard to comprehend all that has happened so far. No one's wasting any time! 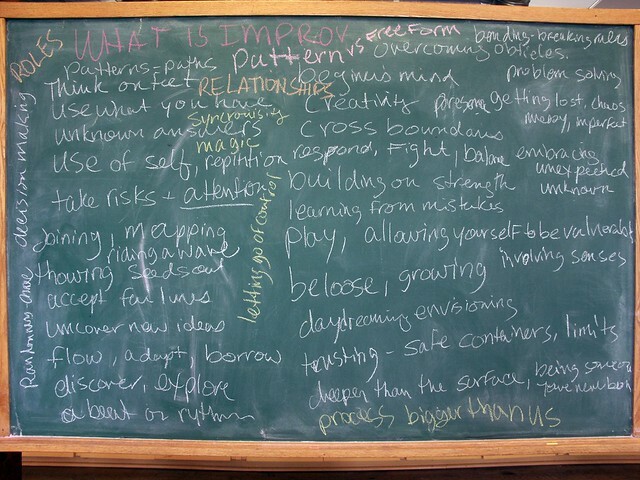 Day one of the improv quilting workshop began with conversation and brainstorming on the definition of improv. In the afternoon we began the first sewing assignment, strip piecing without a ruler. We used the brown bag random method of choosing strips and then repeated the exercise making our own decisions. Some people liked not having to make any decisions and some people hated not having control. Well the whole point of this and all of the exercises, is to create controlled experiential containers or events so that the students can notice their their preferences, patterns, reactions - positive or negative - or in other words their rhythm of attention. Strip piecing, without using a ruler also served to teach some basic improv sewing techniques. 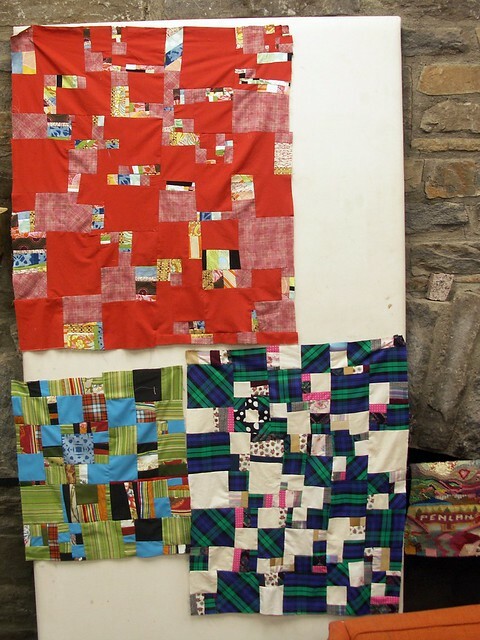 Only one person in the workshop has ever made a quilt before and some people have never even used a sewing machine. On day two we started with a talk about randomness, and limits. I read for 20 minutes from Compositions I-VI, by John Cage, until one of my students, interrupted in a loud and frustrated tone, ARE YOU JUST WAITING FOR ONE OF US TO ASK YOU TO STOP! John Cage's performances were frequently interrupted so this was completely fantastic. The students got a good taste of how the mind works to create meaning when confronted with language. When you listen to Cage for the breath and cadence, and hear the words as sound, and let go of understanding then the experience can be expansive. 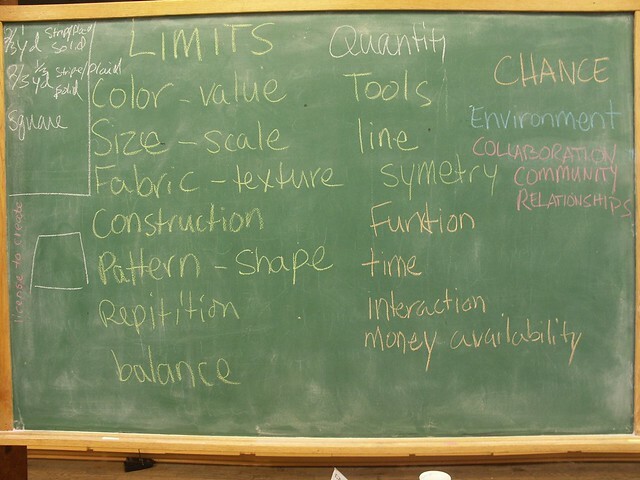 Later that afternoon we explored limits vs rules and brainstormed the ways we can set limits, or parameters for our improv quilt making. I introduced the concept of working from a score. I'll say more of this on the next Improv Monday post. They then created quilts based on the same score. Below are three variations, each made by a different student. Today they are using a traditional quilt block pattern for their score and improvising as they continue to repeat the block (or perform the score) each time. They are free to change the limits of the block, the scale, color, shape, order, etc, and will then combine their series of blocks into a quilt top. Okay there was a lot more on top of all of this including a Group Stitching Mantra, but that needs a whole post all on it's own. AND I stayed up until 2 PM last night working on my newest piece so I'm dead tired in a good way. AND the wood working and photography instructors are about to share slides of their work in the assembly hall. So More later!!! PS. I'm loving all of your recent comments even though I've been too busy to respond or keep up with what's happening elsewhere in the blog-o-sphere, so please keep them coming.